After just over a year, from my initial idea, my event in London finally happened. I genuinely can't believe how fast it came round and how quickly it was all over! It was an early start for me personally as Dave and I loaded the van with everyone's goody bags and all of the other stuff I decided I want to take with me for the weekend at 7am and set off down the M1. We arrived at Tiger Tiger (after some road rage from Dave and a faff with parking) with all of the stuff to set up and I was genuinely thinking to myself 'What if no one turns up??' I'm such a perfectionist about these types of things and it made me extremely nervous. I'd been growing nails for weeks and in that morning I'd successfully managed to bite them all off again. Luckily almost everyone turned up which was fabulous and I'd just like to take a minute to thank Clare, Natalie and Kat for helping me and Dave to unload the van - you're all stars girls! I was literally shaking with both excitement and nerves at the beginning of the event - to the point where I was having issues giving everyone their name badges. Oh well! I soon got a drink in me (thank you so much Kat), then I had a cider and managed to steady myself. It was fabulous to finally put faces to Twitter handles and blogs, have a laugh and a joke with everyone and simply chat - even if one of the customers who happened to come into the bar thought I was working there (cue some confusion and then a lot of laughing)! 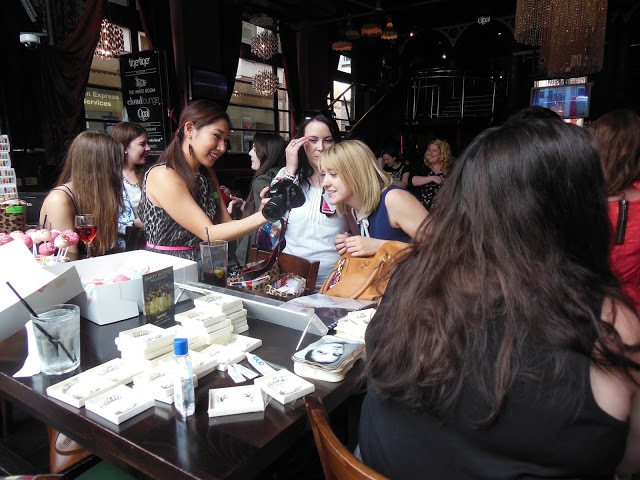 I didn't have any time to take any photos so all the photos you see above are courtesy of the bloggers that came to the event so a thank you to them for letting me use them! I was extremely lucky to receive gorgeous gifts from Emma, Ana and Grace, by way of a thank you, which I was blown away by - thank you so much girls! 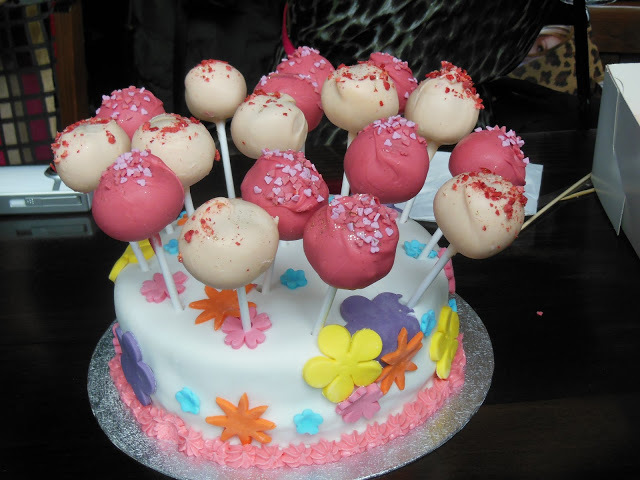 My great friend Jess made the amazing cake pops and cake which went down really well (even the Tiger Tiger staff asked if they could have one!). 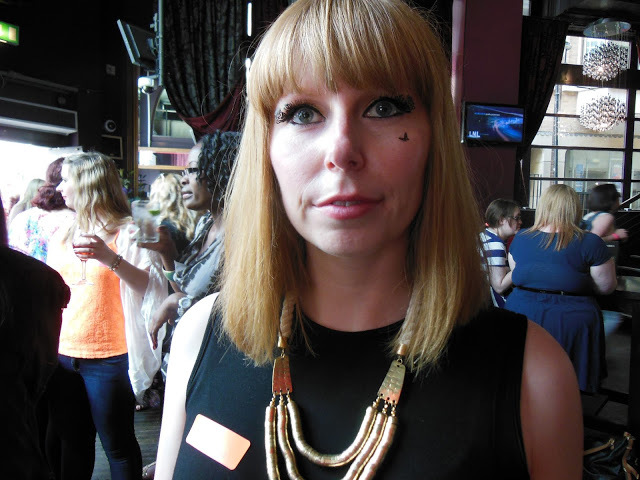 The beautiful Itsu from Paperself arrived to set up and was very soon giving everyone stunning eyelashes - which you can see more of on the blogs of the bloggers that came (some ladies didn't have them applied because their eyes were sensitive). It was wonderful to see everyone enjoying themselves and laughing/talking/chatting. I felt like I didn't get to spend as much time as I wanted chatting to everyone so maybe if I see you all at a different event then I will get time to talk to everyone properly! Anna from Apivita was also there to chat to everyone and talk about the brand, which had contributed to the bags with amazing samples. Bernice from Kekeli Radiance also came to speak to the bloggers about her brand, which is launching this autumn and sounds incredibly interesting. I had an amazing time and I want to thank everyone so much for coming! We all split into groups soon after the goody bags were given out - purely because we all had slightly different agendas (I also don't think any shop would have been happy about 30+ of us wandering in unannounced). I was incredibly restrained - especially when Grace took us into Illamasqua to have a look at the sale. I didn't buy a single beauty bit. Completely accidentally Vicky and I ended up on our own so we dashed to Primark together where I picked up a beautiful necklace and a couple of cheap canvas bags to try and carry everything I had left over from the meet up across London. A little later, with Islay, Clare, Natalie, Kat and Grace, we all went for cake whilst it stormed across London (it was Grace's idea and it was such a good one - it was lovely to just sit, chat and relax after a day of being on our feet). Islay and I then made a long trip across to Hackney where we were staying in a small but friendly hotel (in a rather intimidating location admittedly). Sunday was a lot more relaxed and less 'event'. Islay and I had breakfast in Starbucks before going to Selfridges to meet up with Clare and Natalie again as well as Christina and Jordan. We poked around Selfridges, where I bought my blogging diary for next year and a little set of stickers with a quote on. The quote was 'Just when the caterpillar thought the world was over, it turned into a butterfly...' which rings so true in my life. Then we hunted down a Superdrug for Jordan to purchase some Sleek items (we learned that Google Maps lies - it told us the nearest Superdrug was Covent Garden - LIES - the nearest one was in a tube station on Bond Street!) and then we all went to Covent Garden so we could visit the MAC Pro Store and I could finally have a mooch in Space NK (meh - I was a little let down to be honest - I thought it was expensive, over-hyped and the staff didn't even acknowledge us). Clare, Natalie and I joked that we felt old in comparison to the younger three of the group as all we wanted to do was sit down because of dragging our overnight stuff around with us. On Carnaby street I visited Cowshed and made an impulse purchase I was very pleased with in their sale. It was such a strange feeling then to realize that the weekend was finished when Islay and I boarded a train to come to Stoke-on-Trent at Euston. I couldn't believe it had all flown by so ridiculously quickly. I feel as though I blinked and somehow I missed it - it was such a fantastic whirlwind! I had such a great time though and that was followed by Islay coming to stay at my home for a couple of days for a trip to Alton Towers and a little bit of watching Dave try to half-sleep walk through the front door (it's probably best not to ask). Below is a list of the amazing bloggers that came to this event - remember to check them out if you don't already follow them! I also want to say a massive thank you to all of the brands and lovely PRs that got involved with the goody bags - I think it's safe to say that there was something for everyone in there! It really did make me feel like Santa when the bags were given out - there were audible little squeals of delight when everyone saw what was in them. I can't wait to read all of the reviews and see what everyone thought of the different products. It was an amazing feeling to know that everyone enjoyed themselves and, to be honest, a relief too. 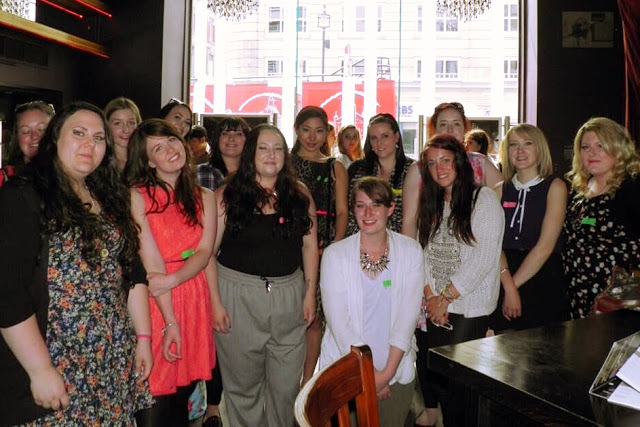 I have a blog post about my tips for planning a meet-up/event so please take a look at that if you're thinking of planning one yourself. Also, I'll be arranging another meet up very soon so stay tuned for that... Now that I know what I'm doing (sort of)! If you'd like to see some vlogs of the day on YouTube then please watch Emma's (with the chance to see a big willy - oo-er!) and Islay's vlogs from the meet up - both are fantastic and I loved watching them so I recommend that you do too! Give them a thumbs up and subscribe if you haven't already! Helen, you are a true star for organising this, i was so nervous at this event but everyone made me feel so relaxed and calm including yourself, i got to meet grace who is just lovely and made so me new blogging friends! Sounds like you had a fab time! 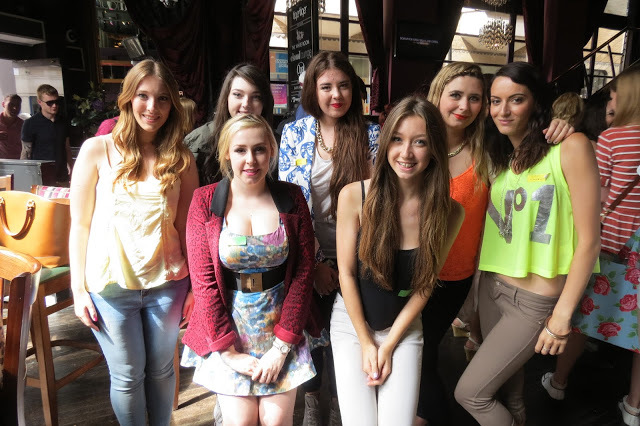 i really need to start coming to more meet ups! Only just seen this as been on hols, but thank you SO much for such a fab event! It really was wonderful to finally meet everyone, and you!! 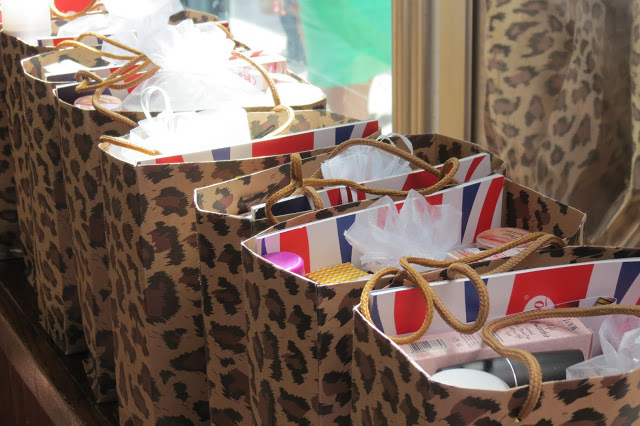 The goody bags were truly amazing, I've found a few things in there that I've fallen in love with! Look forward to hearing about the next event!